“It’s a camp thing.” “You wouldn’t understand, it happened at camp!” These are two of the comments I hear from my children on a daily basis. Our dinner conversations often consist of the two of them trying to tell another camp story at the same time, always resulting in an argument over who started their story first. These nightly battles inevitably end with each telling me I wouldn’t “get it” because I wasn’t there. In their eyes, I’m old. (Older and wiser.) They don’t realize, I do “get” it. I went to camp too, and I speak their same secret language. Memories of my first summer midst the sturdy pines of Maine in 1984 are as vivid as the visiting day I spent back at my second home the last few Julys. It felt like I had never left. It smelled the same walking down the pine path to the lake. The doors still creaked open and slammed shut with the same familiar sound. The bugles made my heart skip a beat. The songs at assembly were the same I sang as a child (minus some words and tunes my daughter and I argue about). The tables in the dining hall were still the same light green. My pictures were still on the walls of Main Bunk. The sound of the ski boats, and echoes of color war cheering were all exactly the same. Nothing had changed, but yet everything was different. The last full day of camp is spent packing and signing the camp yearbook. My first summer, I remember getting my copy and being so excited to start getting signatures. I looked at the cover and immediately realized the picture was drawn by the girl I admired most from the oldest bunk. It was her last summer, and I had seen her crying at breakfast. I was excited to go home and didn’t understand why she was crying. I was a newbie. I was just learning the secret language of camp. The title of the yearbook was “Everything is Different, but Nothing Changes.” I wasn’t quite sure what that phrase meant at the time, or why all the oldest girls wrote messages in my book about ‘savoring every moment’ making the memories last, and how quickly the years would pass. How could I fully understand? No one learns a language fluently in two months. I hoped by the time I was the same age as my ‘big camp sister’ (15 seemed so old!) that I would figure it out. What would be different if nothing changed? I imagined my daughter wearing camp uniform before she was born. My kids knew the words to camp songs before they learned to walk. My camp friends are still some of my best friends on earth. They were bridesmaids in my wedding, the Godmother to my children, and those special, true friends I call daily, (or several times a day). These women sent camp colored baby gifts (even to my son) and love to sing camp songs with my daughter when we are together. Recently I drove my daughter to see a camp friend for a few days. I went to camp with her mother. Watching their 9 year olds’ faces as they hugged for too long with tears in their eyes, we both got choked up. I kept thinking to myself, my daughter is not old enough to have this type of friendship, she can’t possibly love her camp friend the way I love mine! The other mother and I looked at our kids, and then at each other. We all spoke the same language. Shhhh…It’s a secret. If you never went to camp, you wouldn’t understand. I am lucky to currently be working with camps in Maine. I get a taste of my childhood while being surrounded by children sharing similar experiences to my own. 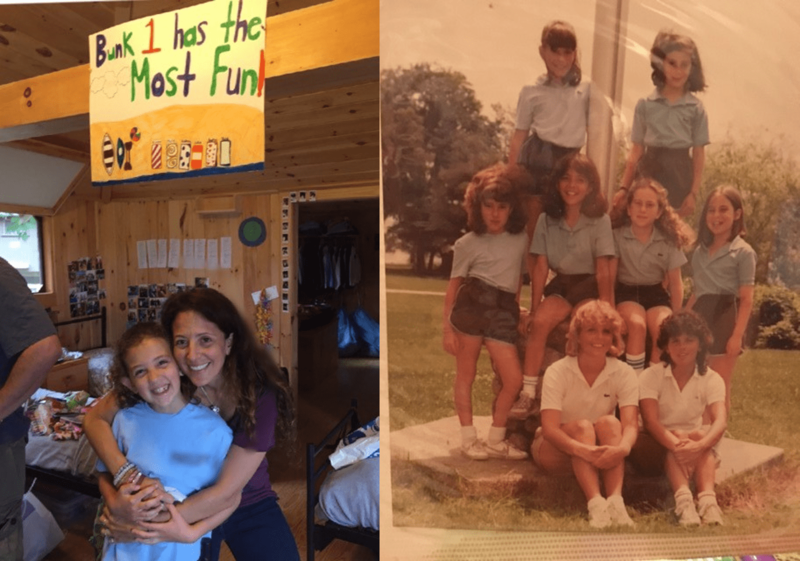 As my two kids continue to grow and thrive each summer, I truly hope they gain a deeper understanding of the secret language of sleepaway camp. It is my dream that they realize the traditions have remained intact for almost a century, and that while there are minor differences at their camps, so much has remained exactly the same. I know their unique experiences will help shape their lives the way that my camp experience has been such an incredibly huge part of my life. Life on earth may be changing all the time, but like sleep away camp, so much remains the same. I take comfort in knowing that the camp experience is still so similar, despite the way the world has moved forward. Hairstyles, clothing trends and pop culture may be different today, but the smiles and the secret language of camp has not changed a bit. I am going to reach out to my role model from my first year at camp and let her know I still think about her 30 years later. Then I think I will call my mom. I know she “gets it.” She sent me to camp for the same reason I am sending my kids. And everything was different for her then, but nothing has changed. I need to thank her for letting me in on the secret language, one day I know my kids will thank me.